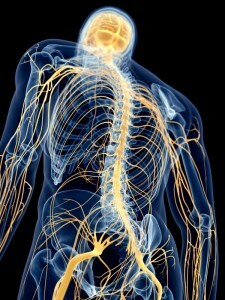 Does the Nervous System control the body’s ability to self heal and self regulate? If this is true, then why doesn’t a cut finger stay cut forever? It self-heals whether we think about it or not! Your body is self regulating every second. Your heart continually beats, your breath is regular, you constantly digest the food you eat, your body temperature will remain consistent temperature even if you get too hot or cold. The examples of self regulation are endless! The Central Nervous System (CNS) coordinates everything. Nothing in our body would ever happen if the CNS couldn’t sense the internal and external environment and communicate what it sensed to every single cell, tissue and organ in the body. When the communication between the brain and the body becomes inefficient, ineffective or even inappropriate, the body begins to break down. It moves away from wellness and toward chronic disease. Chiropractic is concerned with improving CNS function and communication between the environment and the body. The role of the chiropractor is to help facilitate and restore the appropriate communication between the brain and the body by removing Spinal Subluxation to allow the body to self heal and self regulate. Chiropractic helps people become better self healers and self regulators. In order to understand how critical Chiropractic becomes to a wellness paradigm, let’s better understand the relationship between the CNS (brain and spinal cord), the spine, the environment and prolonged stress. Discover where you really are on the wellness continuum.